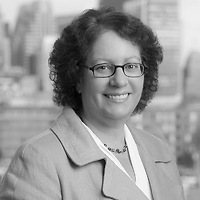 Beth Mitchell, a partner in Nutter’s Real Estate Department and co-chair of the firm’s Commercial and Real Estate Finance practice group, was voted to a one-year term as treasurer of the American College of Mortgage Attorneys (ACMA). ACMA is an organization comprised of more than 450 lawyers in North America who have experience in the mortgage law industry. ACMA brings together leading practitioners in the United States and Canada who have distinguished themselves through bar association activities, lecturing, publishing, participating in the legislative process, and writing briefs and/or arguing cases that are significant to mortgage transactions. Beth is a frequent writer and lecturer on mortgage law and other real estate topics, and has addressed ACMA on a range of topics. In addition to ACMA, Beth is on the Board of Governors of the American College of Real Estate Lawyers, a past president of the Real Estate Finance Association (REFA), and a past clerk of the Real Estate Bar Association of Massachusetts. She has been recognized nationally and internationally for her expertise, ranking among The Best Lawyers in America and in Chambers USA: America’s Leading Lawyers for Business.